Brian Milton is a born adventurer. His first major expedition was in 1968 when he drove a battered Austin 7 Ruby across the Sahara Desert to meet his fiancée!! Ever since he has combined a career as a TV presenter and financial journalist with a series of incredible airborne adventures around the world. In 1998 he become the first person to fly a microlight around the world, a feat that earned him the Britannia Trophy, one of the world's greatest aviation awards. 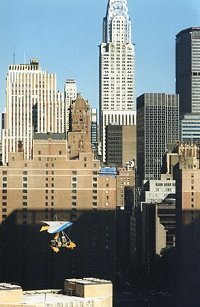 However one of his jaunts, an attempt to cross the Atlantic non-stop by microlight, was dramatic for all the wrong reasons and didn't quite go as planned. Read all about it in Brian's latest book "Chasing Ghosts". Brian's account of his visit to Buckingham Palace on Thursday, December 8, 2011. The stories of the few surviving former pilots who flew the aircraft during the Second World War. A history of the greatest heavy bomber on any side in World War II.